After steaming (cooking) the pinas, generally by horno (oven) or autoclave (stainless steel oven), inulin carbs transform into fructose. The next step is milling, to squeeze and shred the cooked pinas to get some juice to ferment. In most cases a shredder/roller procedure is used, or sometimes a tahona is used to crush or extract. Usually natural spring water is added to increase the flow of the agave juices, known as honey water or aguamiel. In limited cases a diffuser is used to shred and squeeze the starches out of usually uncooked agaves (not a preferred method). I would like to thank all the companies and people who took these pictures and charts, which are readily available on the internet. Shown Below- stainless steel, wooden, and cement/stone fermentation vats (tanks). FERMENTATION- When adding natural airborne or proprietary yeast into the vats containing aquamiel during fermentation, the yeast fungus will eat the sugars, and the discarded "waste"... YES- IT'S WHAT YOU THINK, will become alcohol, in the form of ethanol, carbon dioxide and other aromatic compounds. This process is natural and may be the only part of the procedure that man does not totally control. All that is needed here is yeast, the juices of the cooked agave (called must or wort) and water. Yeasts are living, and they give up it's life for our benefit.... and for our Tequila, through enzymatic processes. I say we owe the yeast a big 'Thank You'. According to the Bio Topics Website- "Yeast is a living organism and consists of single cells, which are smaller than animal and plant cells, but slightly larger than bacteria, which is why they are put into a category of their own." Fermentation is simply converting sugars and/or carbohydrates to alcohol, by using yeast in anerobic (non-oxygen) conditions. 'Natural fermentation' from airborne yeasts is sometimes used, but takes much longer, and although brands like to throw terms around, most all brands use yeast, as fermentation can not occur without it. Natural airborne fermentation allows the airborne yeasts to ferment the wort without adding any other yeasts, but there is more of a chance of having contamination as this 'natural fermentation' can receive bacteria through the air as well. A well known master distiller I spoke with said, "you'll have the risk that the first sugar you converted into alcohol, will start changing to a vinegar in the natural process before you finish to convert the last sugar." He went on to say, that a fuller population of yeast prevents such disaster. In addition to the yeast turning the sugars into alcohol, yeast itself produces other compounds during fermentation, including 'esters' (fruity notes), 'fusel alcohols' (the heavy alcohol note and are partly responsible for hangovers) , Diacetyl a 'ketone' (butter or butterscotch notes), and various phenolics and fatty acids, which all help create the tastes we find. Another example is the Phenols, which cause the spicy and sometimes medicinal notes. The two main categories of yeast used in tequila are commercial brewers yeast, and yeast that comes from pre-cultivated existing yeast, that has been preserved. The type of yeast most commonly found in tequila is saccharomyces cerevisiae, which contains many strains. The use of either type of yeast can result in different taste profiles. Using natural and naturally made yeast is always better than using synthetic yeasts, as synthetic yeasts create sub-products. Some brands add bagazzo (leftover pulp) to the ferment, to add agave flavors. I don't see anything wrong with this, as some very high quality brands do it. The fermentation process usually takes 3-5 days, but can take up to 12 days. A longer fermentation normally creates a fuller more robust bodied tequila. Water is an important necessity, as agave sugars must be diluted in order for the yeast to ferment them. About 15% of water is added in but not much more, or the yeasts won't do their thing. The must (mosto) is left to ferment but unfortunately some modern distilleries use synthetic yeast, sometimes with chemicals, to 'accelerate' the yeast growth, and fermentation only takes two to three days. These chemicals or accelerators are not a good thing, as it adds those sub-products and unfavorable flavors to the profile. Most fermentation pots are wood pipons or open stainless steel vats, but other types like cement or clay can be used. Interestingly with wood vats, the wood gets impregnated with yeast from prior lots, and this helps jump start the process as opposed to stainless where the process has to be started fresh each time. The notes you can smell over the fermentation vats (minus any vinegar aromas), are the same notes you should recognise later, after distillation. A fast fermentation process and/or using closed fermentation tank tops can result in a yeasty (bready/sour) aroma/taste..... not what you want. Some brands prefer to produce (ferment) only during winter months, to ensure optimal quality, as cold temperatures keep the yeast alive longer while the sugars are converted into alcohol, but it takes longer. The temperature is critical, and if it's too cold fermentation will slow, and if it's too hot it causes the yeast to die off, keeping in mind that the process of fermentation itself, produces it's own heat. This is important to keep in mind, with the heat in central Mexico. Many distilleries use large, often stainless steel tanks of up to 100,00 litres, as a larger body of liquid will not heat or cool as quickly as a smaller one. Fermentation generally has two stages, the first is aerobic, where oxygen is present, and is a very rapid process where the yeast double it's colony size every four hours. This part normally lasts 24-48 hours. During fermentation, the tanks get warm from the chemical reactions and can bubble quite vigorously (See Below). The juice seems alive during fermentation. Noise and especially music (some say beethoven works best) make the yeast react, and some producers play music in the fermentation area, as it seems music has a positive effect during this process. The second part is anaerobic, where no oxygen is present. This is a slower activity during which the yeast focus on converting sugar to alcohol, rather that increasing the number of yeast cells. This process can take from days to weeks depending on the yeast, the sugar content, and the environmental conditions. Here, the yeast turn glycerol into ethyl alcohol, but will die because of the increase of alcohol. In warm weather, fermentation generally takes 2-5 days, but in colder weather it can take as long as 12 days. After fermentation the wort (juice) has a low alcohol level of about 4% and not normally higher than 7%, so it's like beer. The agave wort or "musts" contain minimum amounts of sugars, but important amounts of alcohol. Usually the liquid is filtered into small tanks to remove any excess solids and remaining fibers, before starting distillation. After the fermentation, dead mosto contains more than 100 compounds. Distillation in simple terms, is basically the process of separating a liquid or vapor mixture into it's component parts, through vaporization and condensation. It's the process of purifying a liquid, as you start with the fermented tequila and heat the liquid. Since alcohol boils at a lower temperature than water, it will turn to steam before the water does, and rise up in the still. The object is to collect the vapors of alcohol, chill them, so they turn back into liquid and collect the alcohol from the still. Tequila is doubled distilled at minimum, by regulations. The first distillation is called 'Ordinario', and after the second distillation the liquid is called 'Tequila'. The idea is to separate and purify the fermented "musts" to eliminate any undesired elements, and doing so is called 'cutting heads and tails'. Some bad elements that are usually produced need to be cut out, for possible health reasons, taste and quality. All of these components are very important to the smell and taste of the tequila. At 83°C these and other components start to vaporize. Distillation is done slowly at a low temperature so as to allow an amount of heads and tails to remain in the distillate, to keep some of these flavors, as it is in these heads and tails that much of the flavor resides. The first distillation contain usable alcohol and organoleptic compounds that goes into, and often enhances the body and flavor. Some brands cut the 'heads' more than others, but at least one well know distillery who makes one of my favorite tequilas, doesn't cut the heads at all. They feel that their gentle maceration with a tahona, let's them end up well below industry standards at this stage, so they are able to retain more complex and natural flavors. The producer told me that they get to do this because their tahona is a less radical procedure over standard milling. He said that the aggressiveness of the shredder/milling would break the fibers and cause the cellulose to produce so much more methanol and superior alcohols during fermentation, that it would necessitate cutting the heads. Keep in mind that this is NOT normally the case, and a vast majority of brands cut the heads, which are generally trimmed away and removed. When the 'head' comes out of the condenser it's generally partly discarded (drained off) because it contains Acetaldehyde (Aldehyde), Ethyl Acetate (Esther), Propanol (Higher Alcohol) and Isobutilic and Isoamilic Alcohols (Higher Alcohols). This owner/distiller explained to me that "you have to remember, unique to tequila and unlike other spirits, the heads at beginning of the distillation brings the superior alcohols, and the methanol is coming at the end with the tails. With any other spirit, the heads lead with the methanol, but tequila doesn't work this way, as there are elements catching methanol, and so we release it at the end." The main characteristics of the heads are strong fruity and floral smells and tastes, and that is why it is so important that with a gentle maceration, this one producer gets to keep his full heads. Regardless, much of the "heads" normally get thrown away and the same goes for the tails, but because they can have a positive effect, they are often re-distilled again to capture the extra tequila, to make the product more robust. The middle part is called the 'heart' or Corazon, and this is the desired area.... 'the sweet spot', and it is saved for the second distillation. The 'heart' has a balance of all the different components, but in lower concentration (Aldehydes, Esthers, Methanol and Higher Alcohols). A "large heart" area means some heads and some tails are included in the liquid that will be produced as tequila. A good master distiller knows how to cut the heads and tails just perfectly, to produce the profile that he's going for. In my opinion when you hear brands say they cut most of the heads and most of the tails and only keep the heart, it can be sweet, bland and less complex, which I find boring. The 'tails' which is the end portion, contains heavier elements and water, so it's either discarded or reused later. At 95°C other components start to vaporize. These components are Acetic Acid (Organic Acid), Ethyl Lactate (Esther), Furfural, Benzaldehyde (Aldehyde) and the dangerous and most critical component of Methanol, which can be toxic in extremely high concentrations. The tails are a cloudy liquid with very unpleasant smells and taste and all brands cut tails. Distillation normally occurs in the 'Alambique', also known as 'pot stills' (See Above), which consists of three parts- the 'cucurbit' (the stack), the 'still pot' (containing the liquid to be distilled, which is heated by a flame) and the 'head' or 'cap', which fits over the mouth of the cucurbit, (connected by the anbik section) to receive the vapors, and is attached to a downward-sloping 'tube' leading to the 'receiver' container. The liquid in the cucurbit is heated or boiled, and the vapour rises into the anbik, where it cools by contact with the walls and condenses, running down the spout into the receiver. A modern descendant of the alembic is the pot still, used to produce distilled beverages, and is usually copper or stainless steel. Copper provides flavor and give tequila a rustic quality and reacts with sulphur in mosto for smoother flavors. Stainless steel provides an elegant, clean finish. Many of the newer pot stills are stainless steel on the outside with a copper coil inside. Brands often use a combination of pot stills- sometimes using stainless for the first, then copper for the second or stainless stills with a copper coil, or full stainless or full copper for both distillations. Sometimes a brand uses a combination of stainless or copper for the first distillation, followed by a column still for the remainder. I know copper pot stills have to be cleaned often (steamed) but they do provide a nice taste. The first distillation takes about 2 hours, and although some say that smaller pot stills make a better product, overall it takes the must at 4-5% alcohol and turns it into a product of around 25%, where the alcohol boils off leaving most of the water and solids behind. The second and usually the last distillation takes 3-4 hours. The result has about 55% alcohol and is then considered 'Tequila'. Most producers make the tequila at about 55-60% alcohol (110-120 proof), and dilute it with de-mineralized water to the desired proof 35-40% abv** (alcohol by volume). Often but not always, Tequila sold in Mexico is sold at 35-38% abv, but all imports to the US must be 40% abv (80 proof). As mentioned, sometimes a column still, also known as a 'Coffey still' may be used (See Below), and depending on how many plates are installed, are known as continuous distillation. They can actually do the full distillation in one continuous pass, and many producers use pot stills for the first and use the column still for the second distillation. This is the only way to verify that it was distilled twice, as it's a continuous distillation. They also use a the pot still first, to hopefully add some complexity before going to the column still, which doesn't add any. Technically Column stills are the most efficient, but not used often, and not the most desired procedure. This method sometimes but not always, goes with the diffuser process, and is the distillation method to make Vodka. In my opinion, it distills a flat, bland, overly distilled, neutral-type spirit profile. After the first distillation, the alcohol level rises from the 4-7% range to 25%. Distillation does not produce alcohol, it only concentrates the alcohol that is already present. Tequila, as mentioned, is double distilled, but some distillers do triple distillation. Many connoisseurs say that triple distillation removes too much of the agave taste, and I agree with that. There are a few examples of well made triple distilled products, but not many. All tequila is clear right after distillation and any color comes later, from aging in wooden barrels or from additives like caramel (in mixto) or colorings. Before bottling, most tequila is filtered through activated carbon or cellulose filters. 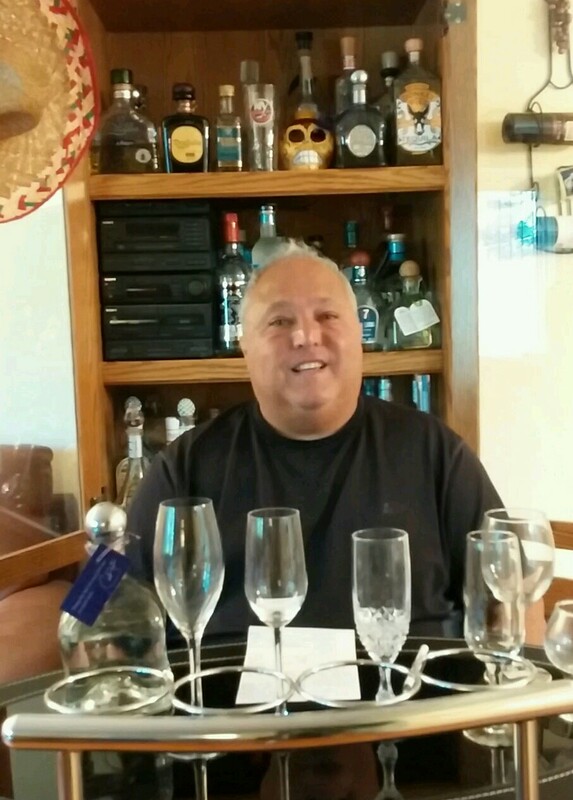 Carlos Camarena and a few others do not dilute tequila with water. This gives it more body and a silky texture. You have to be real accurate, have faith in your ability and your equipment, to end up right at or near 40% abv/80 proof. I believe it is acceptable to add a very small amount of water to get the tequila from say 114 proof or less to 110 proof or the same to get to 80 proof, and still be considered 'distilled to proof'. The limits are +-.5% abv except for the limits of 35% abv Minimum and 55% Max. The US requires all Tequila to be imported and sold at 80 proof and the legal maximum limit in order to call it Tequila is 55% abv or 110 proof. Fermentation and Distillation is a science and an art, and some do it better than others. Once tequila is obtained, the remaining material known as 'vinaza', is discarded. Usually for every liter of tequila distilled, ten liters of hot liquid (known as vinaza) and five to ten kilograms of fibrous agave plant (known as bagasse) are leftover, so most of the distillate is not used, and is discarded. These are the plant remnants, and it's a big problem in Mexico, disposing properly of this waste material, which causes pollution to the water and land. Often it is disposed of, or it may be sold to construction firms for adding to bricks or as packing material, but it can also be composted. There is also a potential but under-utilized market for paper and textiles using these agave fibres. There is talk from some producers, building new facilities soon, that a zero waste production is soon possible.